Review: One of the occupational hazards I’ll likely encounter comes when much-loved artists are subject to my glaring disapproval. And as far as fan reactions go, Nana Mizuki and T.M. Revolution are certainly much-loved and have a solid body of work to back them up – I’ve particularly enjoyed the former’s general excellence on the Nanoha franchise and White Album and know that the latter’s work on Gundam SEED has won him many fans. But just as the most promising corporate mergers can float as often as they fail, so too can artistic collaborative efforts. Nana Mizuki and T.M. Revolution’s work on Valvrave the Liberator’s, suggested that greatness was in store for this pop-rock synergy. Alas, though high on spectacle, “Preserved Roses” lacks the heart and soul that would propel it beyond anything more than your above average, run-of-the-mill electronic J-rock song. On the surface, “Preserved Roses” bears the sort of energy you’d get from a mecha anime’s opening theme. The thumping beat in the introduction arrives on schedule to kick the action into gear, and though there’s a weird key signature difference in the transition between the introduction and Nana Mizuki’s and Takanori Nishikawa entry that sounds really off (something having to do with composer Daisuke Asakura? ), the duo’s vocals come in with gusto to grab listeners’ attention. As the song goes through the verses, Mizuki and Nishikawa each alternate lines, giving us a delivery that possesses much urgency, one that only becomes even more pronounced in the chorus where the burning passion flows forth effortlessly as the two evoke a loneliness that brings a torrent of pain and anger without ever letting up, all the way to the end. But when the last notes and vocals fade away, there’s little to compel me to hit the play button to listen to it once more. The song is so devoid of catchy hooks, so routinized, and so generic that neither artist manages to impress. Perhaps that’s what happens when the presentation is so in your face that there’s little to contrast one section from another, robbing the song of nuanced emotions and expressions. which I found suspect. There, Nana Mizuki’s vibrato is over-embellished to the point where it’s unpleasantly airy, lacking a firm vocalization that would have worked better. It’s safe to say we’re not getting Nana Mizuki at her best and this sticking point is enough to lower this song’s appeal. So on the whole, “Preserved Roses” is passable though neither artist stands out as I feel any J-pop and any J-rock artist could have come together to make this song with the same results. In light of that, that may be its most damning aspect; in spite of the talent behind it, it fails to rise from its genericness to become one of the more memorable OP/ED themes scattered about this season. Who’d think Anime Instrumentality would review something as mainstream as Preserved Roses? Anyways, both T.M. Revolution and Nana, for the better or for worse, are headed to the mainstream, so electronic J-Rock would be as far as they will get in experimentation. Then again, the impression you will get from Preserved Roses depends on the type of music you are used to; if you’re an avid listener of electronic-pop stuff, like most of the anisong public is, the song will be a revelation and a great enjoyment. I can’t deny, though, that I was expecting something a bit more complex. Mecha anime usually get the best music (but seeing as Valrave the Liberator is somewhat cliched as well, it shouldn’t be a surprise). It is a bit of a habit for us to review more obscure stuff, isn’t it? :3 That said, my primary motivation behind this one was curiosity and I felt like I had a bit of a different take worth sharing to see what people thought. I thought Nana was pretty much mainstream given how well her albums tend to sell over in Japan. Anyway, in terms of my listening tastes, I can’t say that electronic-pop is at the top of my list, but I can’t help but think it’s done better elsewhere by artists like say… Kalafina? At least, with Kalafina, you have voice modulation/harmonization that allows the singers to synergize well each other and I feel like that’s absent here. And Valvrave is cliched? Man, I’ve been surprised by its twists. As if the zombie moment in episode 1 wasn’t already lolwut. I actually like the ending song (僕じゃない, by Angela) a lot better. T.M. Revolution is nice and catchy, but Atsuko has a much, much better voice than Mizuki Nana. The market for Valvrave’s music must be pretty high! Then again, we are talking about Sunrise here and they almost always have the opportunity to blow budgets and not have to worry too much about it. I’m not sure if I should say that they are trying too hard or that it’s a sell-out move since I haven’t listened it to myself and that they have talent, but it does feel that they are trying to experiment, but it ends up sounding meh. I recall this when you reviewed Trickster a few years back and didn’t think highly of it (I have it on her greatest hits compilation, but probably won’t listen to it) . While it’s good to try something out of the box, but it has to sound good or else, it will fail… But yeah, I think that Nana’s work with White Album, Nanoha and even Dog Days would sound better to me than this. Maybe a way to engage both fanbases? I guess you can call it a sellout move but well, the sales numbers certainly show off how appealing those two artists are. Hoping this turns out to be nothing more than an experiment, though I wish this instance’s success is more derived from quality versus brand name (which is where I suspect it’s getting its traction from). Interesting review. It definitely made me think about the song a bit more. I thought Preserved Roses was rather catchy, although not exactly unique (imo all Daisuke Asakura’s music sounds the same). What do you mean about Nana Mizuki’s vibrato being over-embellished in the bit you described? It didn’t seem big or wild or anything. Do you mean because she switched to head voice? With some songs by some artists, the original studio release is *not* a good indicator of how well the song will turn out, and with Nana Mizuki’s prolific live video output (of which I only own the Live Grace Orchestra and Live Grace x Union -opus II-) it may be best to defer judgement. For the same singer, compare Eternal Wind -Hohoemi wa Hikaru Kaze no Naka- / Hiroko Moriguchi (Mobile Suit Gundam F91 ED) between original release and Hiroko-san’s live versions from recent performances. For same song, different singers, try Yuki Kajiura’s Synchronicity originally recorded by Yui Makino and the version on FictionJunction – Yuki Kajiura LIVE Vol. 4 Part II (now available on blu-ray). PS, I should finish/write some reviews based on trips 3, 4 and 5 to Japan (2 Nana Mizuki concerts, Animelo Summer Live 2012, Angela, Anison Big 3, FictionJunction CLUB LIVE at Zepp Tokyo, Kagerou Pain featuring Chiaki Ishikawa, Yuki Kajiura Live vol. #10 and the Tower Records Shinjuku in-store live of Chiaki Ishikawa and Natsumi Kon). There have also been a few more CDs deserving of a review that I have obtained recently also. Well, given that I’m reviewing the CD, there’s not much else I can refer to beyond what’s given to me. Otherwise, it becomes a concert report where I get to delve into how the performances differ and which one’s better (that’s the kind of detail I look to catch). 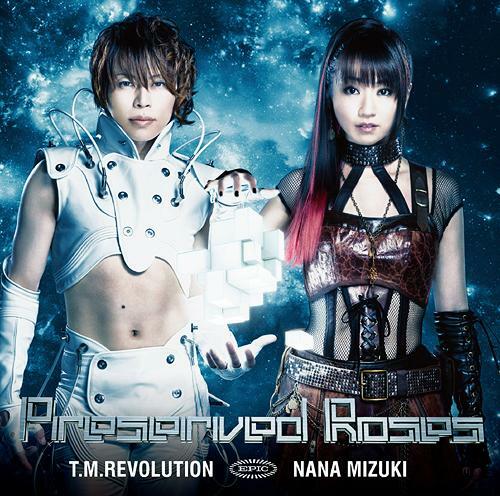 I actually really like Preserved Roses, although that’s probably because I’m a die-hard Nana Mizuki fan. I think their voices match well together and I love the beat. I also think that the beat makes their singing seem way too fast (that’s only when I listen with ear buds though). I know the PV and the music is very mainstream, but I like it and I hope that both TMR and Nana Mizuki get more popular from this single. I’ve enjoyed Nana Mizuki’s output for some time now, but I think she really shines best when paired up with Elements Garden’s composer rather than the person who composes primarily for TM Revolution. So in this regard, we’re definitely not seeing the best that she has to offer. She’s put a better foot forward on other occasions that I’ve cited and this is nowhere close to the top. Oh well. Fun fact: Nana Mizuki was an enka singer when she was younger! That might explain why she still carried vestiges of that classical Japanese sound. As for the key thing, it kept feeling like it was off. Not sure why no one brought it up before I did (or maybe they did and I’m not hanging out at the right places online).